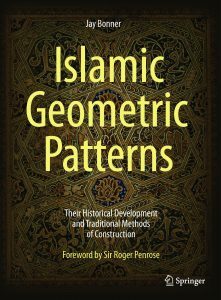 I have documented my research and theories in a recently published book: Islamic Geometric Patterns: their Historical Development and Traditional Methods of Derivation. This is published by Springer. My book contributes to the study of this design discipline in three primary ways: Chapter 1 chronicles the historical development of this art form; Chapter 2 is concerned with the design diversity and geometric characteristics found within this tradition; and Chapter 3 is a highly detailed exposition of the design methodology associated with the polygonal technique. The final chapter is contributed by Craig Kaplan and concerns the use of mathematical algorithms to generate patterns with computers. This book has over 600 pages, with 105 photographs and over 540 detailed illustrations. The forward is by Sir Roger Penrose. The Historical Significance of the Geometric Designs in the Northeast Dome Chamber of the Friday Mosque at Isfahan. Published in the Nexus Networks Journal, Springer (April 2016, Volume 18, issue 1, pp. 55-103). Please note: with apologies, this link is to the Springer Link sales website, and only the abstract and references are available without payment. A 7-Fold System for Creating Islamic Geometric Patterns, Part 1: Historical Antecedents (pp. 141-148), and Part 2: Contemporary Expression (pp. 149-156). Co-authored with Marc Pelletier. Published in the Bridges Conference proceedings, 2012. Three Traditions of Self-Similarity in Fourteenth and Fifteenth Century Islamic Geometric Ornament. Published in the ISAMA/Bridges Conference Proceedings, 2003. Note: Other publications are contributions to various books on Islamic art and geometric design. Please see my complete C.V. for details.